The fragrance in this 5 oz soap-on-a-rope with an 8" long rope is as refreshing as a babbling brook! You'll catch hints of fresh lavender, jasmine, oakmoss, musk and sandalwood. This complex masculine fragrance is quite popular with our male customers and makes a great gift for that special man in your life. However, based on emails, this classic men's scent is equally enjoyed by the ladies! 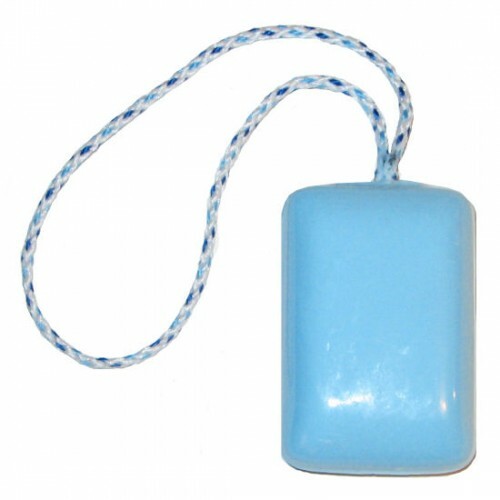 Made by hand in the U.S.A. Net Wt: 6.5oz (184g) Mobility Bath's long-lasting coconut based formula is ideal for either shower or bath and features a 8" soft nylon rope for easy handling. NOTE: This is our interpretation of a classic mens' fragrance. There is no association with the original manufacturer. The Cool Water For Men brand is a registered trademark of the Davidoff design house.